What Is The Military Tape Test? According to the Centers for Disease Control, more than one-third of all adults in the United States suffer from obesity, and over half are now considered overweight and bordering on obesity. If your Body Mass Index (BMI) is 30.0 or higher, it falls within the obese range. Body Mass Index is defined as body weight in kilograms divided by the height in meters squared. (BMI = BW / H* squared). However, the Military Tape Test is a circumference measurement around the waist (belly button) and the neck and placed into an algorithm chart to produce a percentage of body fat. An online calculator can be found at this US Navy Body Fat Calculator. Since the military is a product of today’s society, the military needs to take offensive measures. Already the military overweight and borderline overfat rates have increased in the past 25 years along with societies. The military has strict physical fitness standards and body fat standards. Currently, about 8% of the military is considered overweight/overbody fat percentage. If not, it would only be a matter of time before the military shares the effects of obesity and associated illnesses, such as diabetes, heart disease, and some forms of cancer that the civilian society is now plagued with. Current military body mass policy requires service members to maintain body fat levels below 28 percent for men and 36 percent for women. If they fail the height/weight standards, they must undergo a "tape test" to estimate their body fat percentage. Are not eligible for promotion. Aren’t allowed to attend professional military schools. Are often are barred from leadership positions. All of the services use a simple tape test to make the call on who is too fat but used when a member is exceeding the height and weight standards. 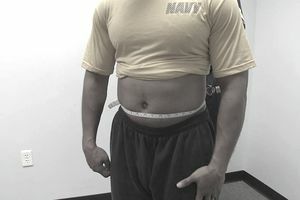 The Army, Navy and Marine Corps use a basic height-weight body mass index tool as an initial assessment, and then those who exceed weight limits get taped. Men are measured at the neck and waist; women: neck, waist, and hips. For both, the neck measurement is subtracted from the other measurements in an equation designed to determine their “circumference value.” Those results are then compared against height measurements using Pentagon-generated charts to determine the body fat percentage. Is The Tape Test Accurate? While the tape test is cheap and easy to administer, many complain that it’s not accurate. The tape test accounts for the size of an individual but does not take into consideration muscle. There have been occurrences recorded of a soldier having maxed out the PT test and failed the tape test. When they questioned the results, and after had Hydrostatic testing, it was determined that their body fat was well within acceptable limits. Hydrostatic Testing Underwater weighing is the most cumbersome method of body fat testing, but it's also the most accurate. You sit on a scale in a tank of warm water, and then you blow all the air out of your lungs and bend forward until you're completely submerged. You stay submerged for a few seconds while your underwater weight registers on a high precision scale. The result is then plugged into a mathematical equation. This test is repeated, and the best results are averaged to get a very accurate reading of the amount of fat in your body. Troops have complained the tape test is unfair, saying it is an inaccurate gauge of fitness with too large an impact on their careers. They feel that the tape test is only administered to ensure that individuals have a proper military appearance and function of their duties or is being given as a punitive measure. The statement by the DoD, “which corresponds to other military goals including appropriate appearance and healthy exercise habits” certainly gives credence to this belief.